I've been looking forward to this brunch for 4 days. I start by pre-heating the oven and cleaning and slicing the entire pint of strawberries I received on Wednesday. Sliced, I put them into a bowl and add 1 1/2 tsp of sugar. If you like them very sweet, use 1 TB instead. Next, I mix the ingredients for whole wheat biscuits. I make mine square, by the way. The edict on biscuit-making is to handle the dough as little as possible. Instead of rolling-cutting-rolling-cutting I just roll out the dough once, pat to make the edges square-ish, and then cut straight lines with a knife. I like the biscuits best unsweetened, but you could certainly add 1 or 2 TB of sugar to the dough if you prefer. Once the biscuits are cooked, I slice them in half, spoon the berries onto the top, and add a little milk to each bowl. Whipped cream would be the classic topping, I guess, but I don't want the expense, and I don't need the calories. We have Summer Tea to drink. It is delicious. Time to brunch: 25 minutes to brunch; 15 - 20 minutes active cooking time. I rarely do anything with strawberries but this. 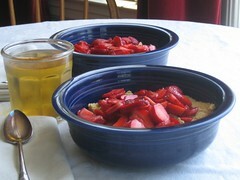 On the rare weeks when we receive two pints of strawberries, I sometimes have this meal both weekend mornings. I've never received a complaint. It's been a very busy week and we have looked forward to relaxing. It's pizza again for dinner—our Sunday tradition. I have learned that you can top a pizza with nearly anything. When we first joined the CSA, we ordered the medium box, and very soon it was just too much for the two of us. When tomato season rolled around, I was overwhelmed. I began garnishing everything with chopped tomatoes, even tomato dishes. One Sunday night I chopped a couple and put them on the pizza, and my word was it good. The heat of the oven carmelized the tomatoes and really brought out their natural sweetness. It was far superior to adding raw tomato out of the oven, which I've seen on many a vegetarian pizza. Tonight I top the pizza with mushrooms and 6 spears of asparagus, chopped. I've never used asparagus on a pizza before, and initially I'm disappointed—I had hoped for a roasted effect. But as is, it adds a nice flavor and a very pleasant crunch to the pizza. I'll do this again. I'm as astonished as you are at the amount of money I have left over this week. I've carefully gone over the spreadsheet several times, but I'm going to scrutize it again before posting the week summary to see if there's a mistake, so stay tuned. Sunday total: $5.91. Remaining weekly allowance: $13.34. Years ago my partner started an environmental book club. We read a book each month, and looked forward to our monthly pot luck meeting. Good food, good discussions, good friends. We took a three year haitus from regular book club meetings after we all had children around the same time. We just started getting back together again this month. Our children are still young, so long books and deep conversation are still difficult. Instead of a book, this month we'll all be reading your Eating Organic blog posts, and when we get together next month for our pot luck, we're each going to make a recipe that you've posted. It should make for interesting reading, eating, and discussion. We've found that planning meals ahead is a great way to cut costs on food, but so often when life gets crazy it is hard to keep up. Are you going to the market or grocery store daily, or as needed? How do you plan your meals? Jessica, I receive my CSA subscription every Wednesday. I spend part of that day or the next making menu plans, and then I go to the store on Fridays to buy whatever else I need. Once in a while, I'll have to ask my husband to pick something up on the way home, but I try to avoid that, since he'll buy it at the corner store - always more expensive. We make biscuits and cut them with a bunny-shaped cookie cutter - "bunny biscuits" are a favorite.